Our range of products include double girder box type goliath cranes, goliath cranes and single girder box type goliath cranes. 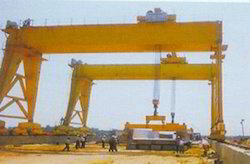 They are used at Construction sites where shifting and moving of building blocks is required.Also at harbours, where heavy cargo and boxes need to be moved.Gantry cranes are also used for ship building.They are used at workplaces where huge bridge cranes cannot be used due to height and weight constraints.Gantry cranes are also used at steel plants, mills etcPlaces where induction and maintenance of heavy engines and machinery are required.Also at areas, where other overhead cranes, bridge cranes, etc. cannot be put to use.Double Girder Box type Goliath Cranes were first developed in Germany. They are commonly used owing to the flexibility and safety, they offer. Gantry Cranes are available in a lot of variants. Some are fixed whereas some are adjustable. 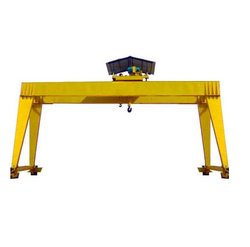 Below mentioned are a few variants of Gantry Cranes Portable Gantry Cranes: These gantries are the ones that are most used due to the flexibility and disassembly feature they have.Adjustable Gantry Cranes: This type of gantry cranes have the facility of adjusting heights, widths, etc. according to the requirement and nature of the area of work. If there are space constraints, then use of adjustable gantry cranes is ideal.A few of gantry cranes are also able to function on rubber tyres where rails cannot be used. Also, gantry cranes are made available in all sizes for enabling use in small work places where a small, but the heavy load is required to be lifted. Owing to years of experience, we are offering a quality assured assortment of Goliath Crane. Offered products are widely used for material handling and are highly appreciated among our clients for their sturdy construction. When it is required to lift a heavy object, Single Girder Box type Goliath Cranes are employed into use to do the needful. They work by lifting heavy loads with a hoist, and can move horizontally over rails that are fitted under beams. Single Girder Box type Goliath Cranes are used to lift heavy objects and are frequently used for ship buildings, wherein heavy parts and engines need to be fixed. Developed in the modern times, Gantry Cranes are being used on a large scale since their development. Gantry Cranes move along rails that are fixed on the ground. They are a safer and efficient option, when the use of Overhead cranes is not possible. Both the cranes are handled by one operator, making it less risky for operations.